Back in 2001 Paul D. Miller aka DJ Spooky That Subliminal Kid sparked a tremendous brouhaha at Burning Man when it was announced he would be spinning at Camp Xara. The story goes that Rangers became perturbed because they believed that his presence might cause a gang incident or something. But the real issue was Spooky promoting himself at the event. How far we've come as a community when the cause for concern back then was the promotion of a deejay. Today, nobody bats an eye when the likes of Tiesto, Christopher Lawrence, Adam Freeland, Daft Punk, Paul Oakenfold, the Crystal Method, Carl Cox, Perry Farrell, etc.) ascend upon Black Rock City with a fanfare and a fanbase. In fact, superstar deejays are a serious draw to many participants, and are nowadays heavily promoted by a variety of media and especially by the camps that host them. It doesn't take a genius to realize that the community (drink!) at large benefits from the juicy phat beats served up free on the playa every night. What's more: the fine folks of BMorg profit from these gifts from said deejays in the result of increased ticket sales from fans. 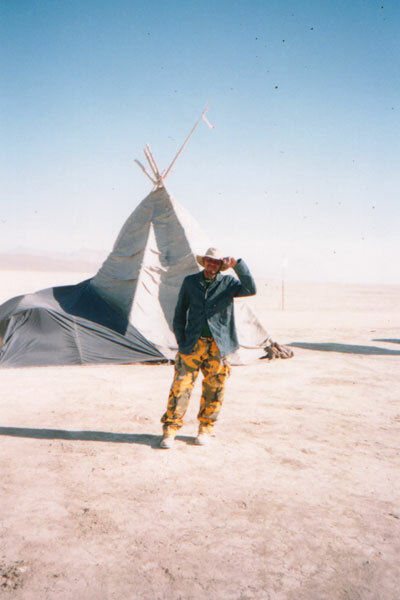 In this video, DJ Spooky brings us all the way back to when Burning Man was young and feral with only 4,000 attendees -- "the ancient mid-nineties." Of note: as I recall tickets were only $40 then. (See image right). 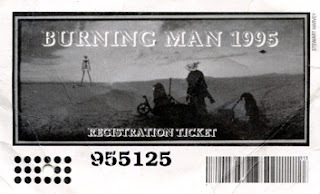 Burning Man Ticket 2001. Cost $165. After a romantic break up, Paul leaves New York to relax and "deprogram." But his attempts are thwarted by Pippi Longstocking's playa-wide hunt to prevent him from playing "commercial music" at the festival. "As Paul mentions at the end of his story, some of the biggest names in commercial dance music are now star performers at the Festival, playing 45-minute showcase sets to massive crowds at MTV-Beach-Party-style setups. Oakenfold, DJ Dan, and Rabbit in the Moon at Burning Man? These guys are some of the highest paid and most accessible names in DJ culture. No offense to the artists -- they've all earned their cred in one way or another -- but it's the Electric Dance Music equivalent of putting a Starbucks or H&M on the Esplanade." Whatever you may feel about what DJ's bring (or don't bring) to the playa and how they may (or may not) enhance your Burning Man experience, the sad truth is that due to the Burning Man Ticket Debacle of 2011, many deejays will not be able to attend the event this year and the BMorg doesn't really give a hot damn. Actiongrl, the Manager of Communications for the Black Rock City LLC recently remarked on an online burner forum called 3Playa: "Bassnectar still can't have my ticket." But Bassnectar is nonplussed. According to recent tweets, he has a ticket but isn't committed to going yet. Recorded at the 2011 Burning Man Summit in San Francisco, California, by Wisconsin Regional Contact Eric Griswold. Posted by Wisconsin Regional Contact Marilyn Besasie. This interview was recorded in front of a live audience at The Commonwealth Club of California in San Francisco on July 19, 2011. Thank you all for being my family. I'll always be around, all you have to do is look for me. 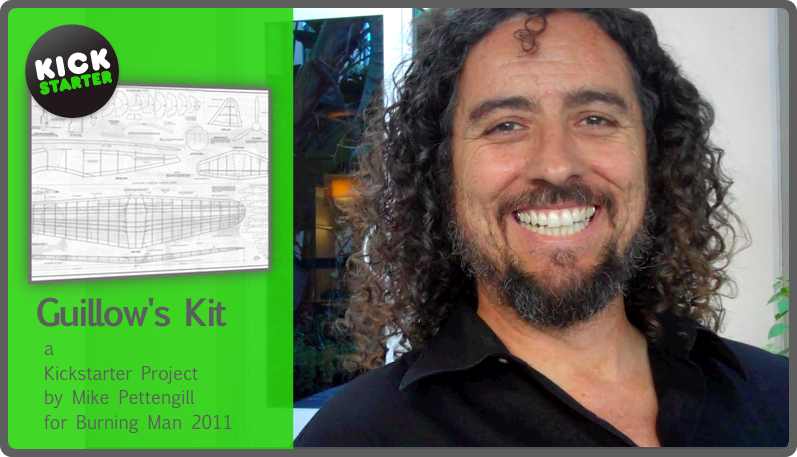 Mike Pettengill's art project entitled "Guillow's Kit" is a comprehensive installation complete with plans, box and model of a WWII Japanese Mitsubishi Zero fighter aircraft at a full scale. The box and the plans will be printed using the technology employed in the printing of billboards. The vinyl plans will be staked throughly to the surface of the dry lake bed at the Burning Man and the box artwork will be fixed to a frame that will be secured nearby. Upon these plans the artist and participants will assemble the 'kit'. Over the course of the event the plane will take shape, be assembled and then covered. The coverings will be reproductions of WWII era Japanese newspapers. The 'decals' of the model will be reproduced using the colors and text of these newspapers in collage. There will be lighting at night that will illuminate the finished model from within and from the outside. The lighting elements, plans and box will be recovered for use on future builds of this sculpture. Wanna support Mike? Back this project via Kickstarter! 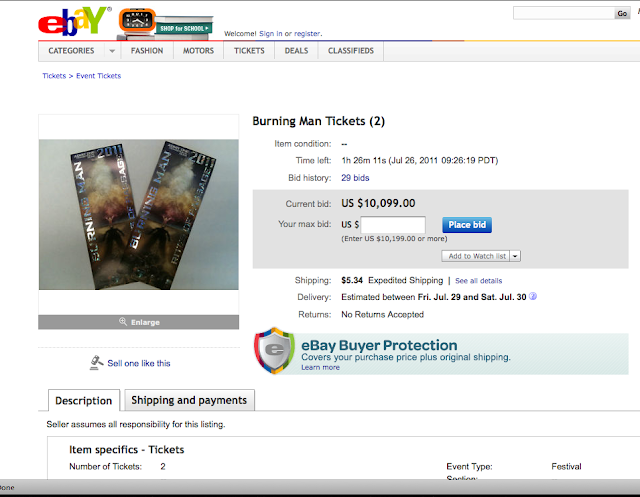 Need a Burning Man Ticket? 2 Available on eBay! No, this is not spam and it's not a joke. If you really want these tickets, you're going to have to find the auction on eBay yerself. And if you're interested, I have some prime real estate on Esplanade to sell ya. In the tony area of 6:01-6:03, right next to First Camp! Leave a comment or DM me! UPDATE: This auction item is sold. We're b-a-a-a-ck after an extended interruption to our Blogger service which prevented us from uploading anything since July 12. We're sorry about that. But we'll be back this Tutu-Tuesday with something new. Travel to Burning Man, through theme camps, day sights, and night experiences. Art installations, performances, art cars, Crude Awakening, the Burning of the Man, and some good ol' alternate reality. 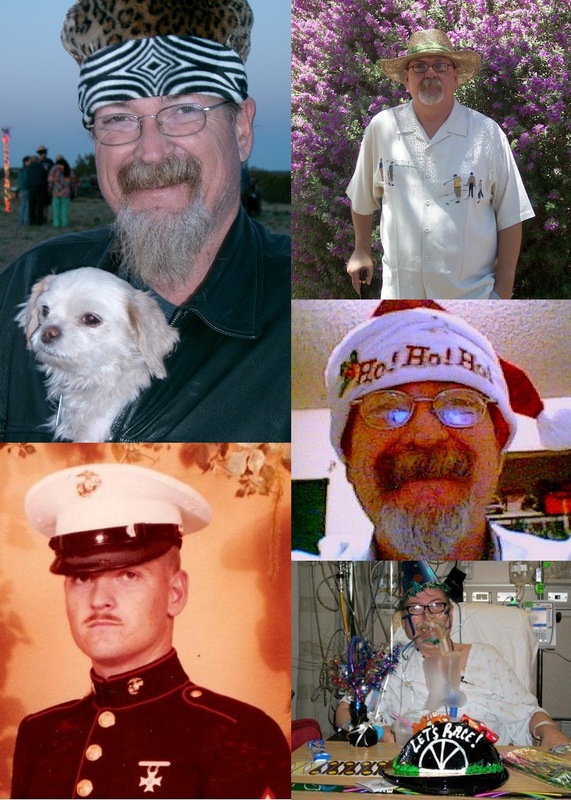 At Burning Man 2010, photographer Eric Schwabel suited up and showed up on the playa in what he calls the "Human Light Suit" and with his camera in hand photographed members of the community (drink!) as evidenced in this video. This year, Schwabel wants to reprise his experience only he wants to go bigger. He figures $18,000 will be plenty enough to upgrade the Human Light Suit so he's launched a Kickstarter project in an effort to raise the funds in order to take him home. Eric also promises more video and images from the project to follow as he moves forward with the project. Stay tuned. BURNBABYBURN from Steve Payne on Vimeo. A few weeks ago we featured a Kickstarter documentary project entitled "Unusual Perspectives" by Burner and Los Angeles filmmaker Paynie. More about the project here. While "Unusual Perspectives" promises to be a worthwhile venture, a decade ago Paynie produced "Burn Baby Burn" another Burning Man documentary that earned him some pretty epic burn cred. Today BURNcast is pleased to present to you this film in its entirety. Shot by me .... a crew of one, back in 2001, on a small Sony camcorder and just 12 one hour tapes, then editing in 5 days with FCP. I still really like this little film and I'm glad it's finally up there for all to see. It's just under an hour and sometimes it takes a moment so start. Be patient. Please help it spread it's naughty little self around and feel free to comment. And thanks to all the support from The Borg and others for helping me get this out there. And .... I'm doing a new film. Please click here for more details.